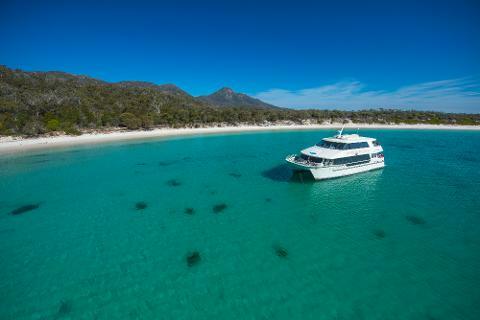 Experience the exquisite beauty of Wineglass Bay, without the crowds, on The Wineglass Bay Cruise on the Schouten Passage II. 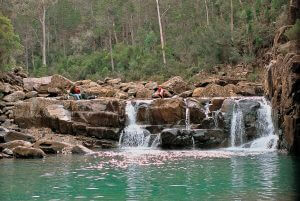 Hazards Beach is a short walk across a forested isthmus from renowned Wineglass Bay. Freycinet National Park was named after the French explorer Louis de Freycinet (1779 - 1841), who sailed through the area around 1800. 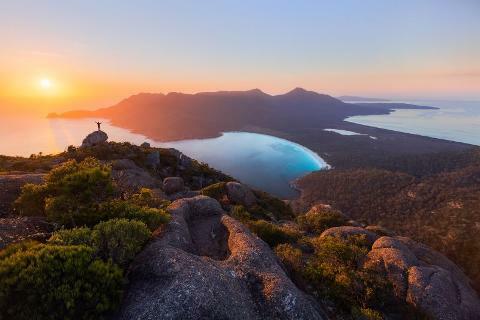 Home to Tasmania’s most photographed view and situated on the breathtaking east coast, you will find Freycinet National Park stretched out along the peninsula overlooking the Tasman Sea and surrounded by the dramatic peaks of the Hazards. Every year thousands of people are attracted to the pristine coastal environments and the benefits of a rural and isolated setting. The powder white beaches and transparent waters of Tasmania’s oldest park, formed over 400 million years, meets the rugged coastal bushland where native wildlife roam including Eastern Quolls and Red-necked Wallabies. In fact, Freycinet is home to 49 species that can only be found in Tasmania. 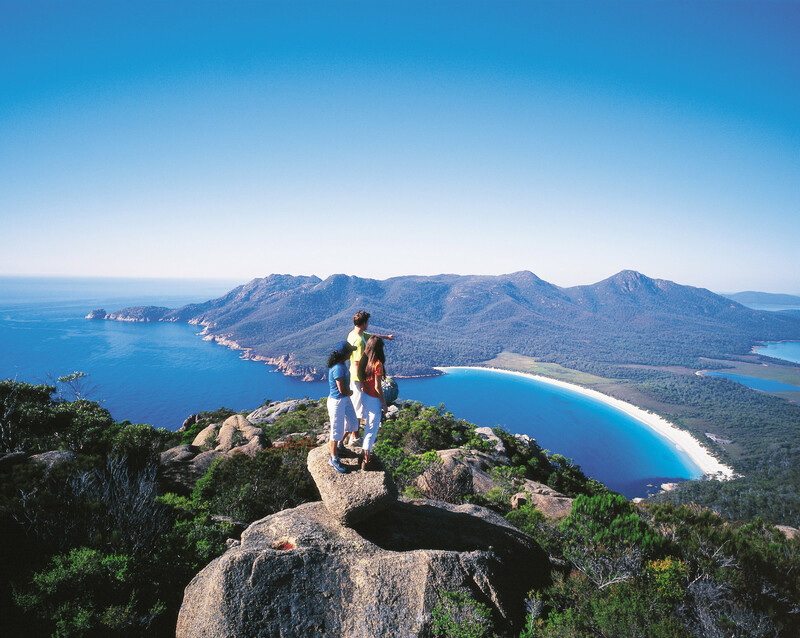 Freycinet National Park is approximately 2.5 hours to 3 hours drive from either Hobart or Launceston. 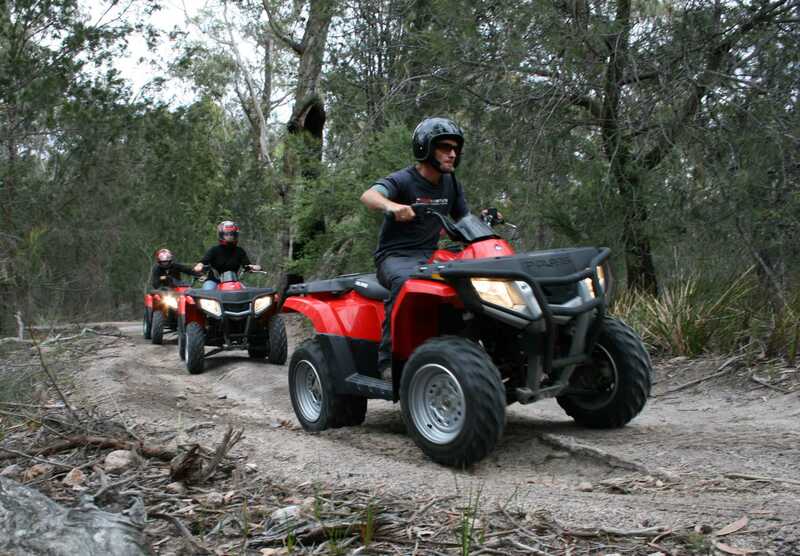 All roads to Freycinet are sealed, so a 4WD is not needed. Drive cautiously from dusk to dawn and keep a lookout for wallabies and wombats. Since you will be sharing the road with a range of wildlife, an advisory speed limit of 60 km/h applies on the roads to and from the park after dark. Follow the coastline of Freycinet National Park to find the secluded Wineglass Bay, one of the world's top 10 beaches, with its pink granite peaks towering over crystal clear waters. The small holiday town of Coles Bay borders the park, and the largest nearby town is Swansea. Walking tracks along the coastline cater to all abilities, whether you’re a leisurely stroller, wishing to take in the scenery on a half day walk, or an avid adventurer setting out on a 2-4 day trek along the entire length of the peninsula, including Bryans Beach and Cooks Beach. Stop off in Coles Bay before setting out to stock up on food and water supplies. Image thanks to Aydan Marrier. Kayak, snorkel, dive or swim in the clear waters to get up close to abundant marine life. Come up for a breath of fresh air and you may even spot a White-bellied Sea Eagle gliding overhead, or an Australasian Gannet diving beneath the waves for a feed. At days end, pack a picnic (or just grab a locally woodfired pizza and a bottle of pinot from the Devil’s Corner Cellar Door) and stick around on the sand to see the pink granite of the Hazards glow pink at sunset. 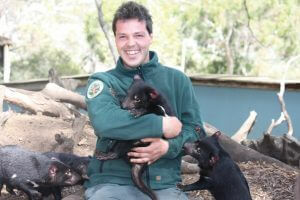 Keep a look out and if you’re extra lucky, catch a rare glimpse of the long term local residents - the Tassie Devils. Freycinet National Park is administered by the Parks and Wildlife Service of Tasmania. Open from 8am-5pm in November through to April and 9am-4pm from May to October, the visitor centre is well worth a visit, retelling the region’s cultural and natural heritage through creative displays. You can choose to participate in a tour or get to the major locations by car or bicycle. The dramatic peaks of the Hazards welcome you as you enter the park. 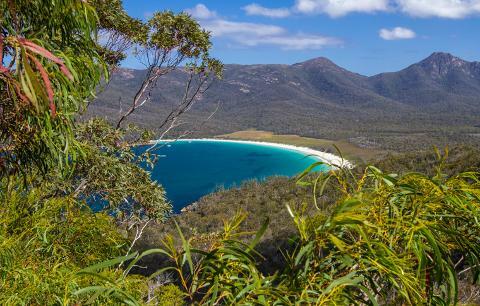 Take a walk to the pass overlooking the perfectly shaped Wineglass Bay or try less strenuous activities like beach strolls, swimming or wildlife spotting. Image thanks to: Flow Mountain Bike. At the Freycinet National Park Centre you can buy your park passes and find postcards, clothing, posters and a large collection of natural history books in the adjoining shop. 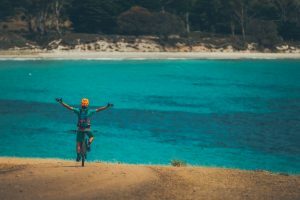 There are several different pass options, ranging from a 1 day pass exclusive for Freycinet, to an entire year pass which includes all National Parks of Tasmania. Find more information at the Parks and Wildlife Services of Tasmania's Freycinet National Park Section. There are many walks to choose from across the park with a variety of lengths and degrees of difficulty. Be sure to bring water, wear proper walking shoes, and have a good map. Longer walks can be more difficult and you should prepare by bringing basic first aid equipment, snacks, and raincoats for changing weather. Image thanks to Tourism Tasmania & Geoffrey Lea. Be sure to check the weather before planning the walks. Aside from these examples, there are other shorter walks which are worth taking. There are also many scenic drives around Freycinet that are worth a look including around Cape Tourville and The Friendly Beaches. The park’s role in conservation is particularly significant due to the vast diversity of its landscape. You will be sharing the park with wonderful plants and animals alike. As in the rest of Tasmania, the vegetation in Freycinet National Park is indicative of temperature ranges and precipitation. More than 500 plants have been recorded within the park, including over 80 species of orchids. Several species have a restricted distribution and many others are listed under the Tasmanian Threatened Species Protection Act 1995 (TSP Act). Wildlife is one of the many treasures of Freycinet. Please take note that the feeding of animals in the park is strictly prohibited and fines will be imposed if you are caught. 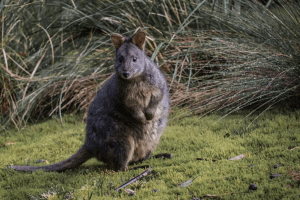 Mammals found include the Red-necked Wallaby, Eastern Quoll, Brushtail Possum, Ringtail Possum, Sugar Glider, Eastern Pygmy Possum, Little Pygmy Possum, Echidna, wombats, New Holland Mouse, Swamp Rat, Water Rat, Tasmanian Bettong and the Long-nosed Potoroo. Cetaceans such as Southern Right Whale, Humpback Whale, and Bottlenose Dolphins are known to use the bay to feed, calve or to take rests. There are also numerous reptiles that are found at Freycinet including lizards, skinks and snakes. Image thanks to Tourism Tasmania & Petra Harris. If you’re a keen birdwatcher, make sure you pick up the area’s bird spotting guide from the park’s entry station on the way in. Owing to the varying ecosystems in Freycinet there are many species of birds that either inhabit or fly through the park. The Moulting Lagoon is a RAMSAR wetland sanctuary and home to black swans, waterfowl and a range of other migratory birdlife. You may also be lucky enough to see a white-bellied sea-eagle gliding overhead or large Australasian gannet diving for food in the ocean. They range from large predator species such as the brown falcon (Falco berigora) to smaller species including the fairy-wren (Malurus cyaneus) and flame robin (Petroica phoenicea). There are also several species which are listed on the TSP Act. Accommodation in and around Freycinet National Park ranges from onsite camping to luxury eco-retreats, with much of it located in the village of Coles Bay near the park entrance. You need a camping permit to camp at Freycinet. Due to the high demand for campsites, a ballot system drawn in early August is implemented from the 18th of December until the 10th of February and during Easter each year. To protect the park’s natural environment, camping is restricted to barriered areas within allocated sites. The nearby coastal towns of Swanick, Swansea and Bicheno also have a range of places to stay ranging from luxury to budget accomodation standards. Visit Coles Bay’s cafes and restaurants to enjoy a wide range of cuisine. Savor everything from coffee to a gourmet farm-to-table dinner of fresh local ingredients. Seafood lovers will appreciate the produce, including east coast oysters, mussels, rock lobster, and scallops. 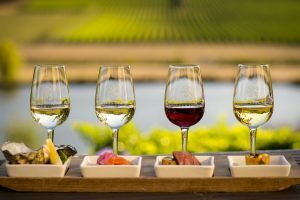 There are also a range of vineyards around the area which are open for wine tasting. Image thanks to: Tourism Tasmania & Rob Burnett.